“In 2010 my wife and I were over $70,000 in debt. The bills were a heavy burden and there was no relief in sight. In the Fall of that year we made a commitment to get out of debt once and for all. 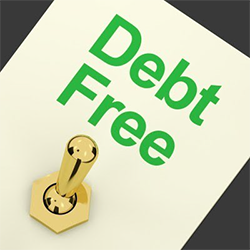 To be debt free we put together a simple (not easy) 2 Step plan: 1) Not taking on any additional debt. We agreed if we can’t pay cash we can’t afford it. 2) Strategically paying off all our current debt, one bill at a time. It sounded easy enough. We verbalized our commitment to each other and created a sensible but aggressive budget. We had had all percentage payments and burden of debt that we could stand and we couldn’t take it anymore. “The lesson I learned from this experience is when my wife and I communicate and agree on a common goal we can achieve any goal we put our heads and hearts to. “The action I call you to take is to set a stretch goal with your partner/spouse, make no compromise, and commit to it. If you are in serious debt you can conquer it in 2016. First, set the goal. Make it specific and measurable. Then, write it down. Studies show that goals have an 80% more likely chance of achievement when they are written down. Finally, verbalize your goal out loud with a witness. Determine your plan, what you must do differently, what action you must take to achieve your new goal. Start moving, take that first incremental step that will be required to create the breakthrough you desire. Keep track of the lead indicators: “paid an extra $25 on the car payment this month.” Report your progress to your mastermind partner on a weekly basis—you will be amazed at the progress you’ve made. In six months reevaluate to see what you have achieved and celebrate each successful step forward.